Here at Kale Crusaders we pride ourselves for being your go-to resource for breaking (food) news and trends but sometimes we fall short. 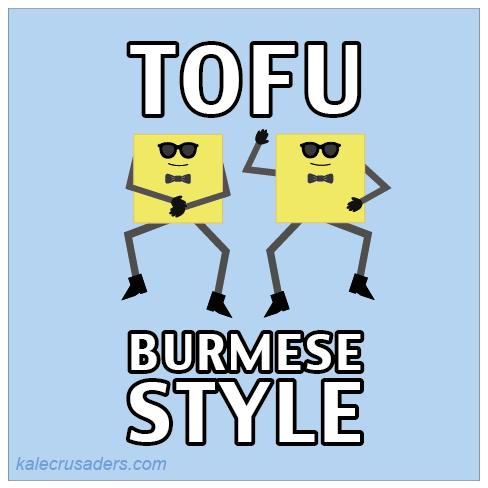 Case in point: Burmese Tofu (or Shan Tofu) has deep culinary roots in Burma and the hit single Gangnam Style by South Korean musician, Psy, harkens us back to late 2012. Regardless of our shortcomings, we encourage you to try Burmese Tofu for yourself. Unlike "traditional" tofu, Burmese Tofu is soy-free and consists of mainly chickpea flour, turmeric, and water. Check out this Burmese Chickpea Tofu recipe by Jennifer Schmidt at Delicious Everyday. P.S. Just a quick shout-out to our two favorite Burmese restaurants in the States. Burma Superstar in San Francisco and Yoma in Boston, located adjacent to Boston's (kind of) famous "vegan corner." Love this one! So cute!